The last two miles of the marathon, I listened to “When I Was Done Dying” by Dan Deacon on repeat. When I crossed the finish line, I felt tired and alive. Reborn. I never wanted to run a marathon. It seemed a nice but rather dull thing for other people to do. I liked mixing my runs with kickboxing, spinning, and boot camp classes. I was happy to plateau at half-marathon. 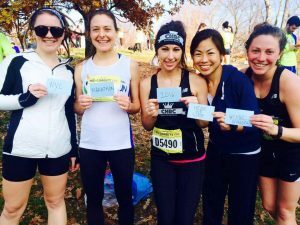 Waiting for the Brooklyn Half to begin one year, I overheard two 20-something women talking. “Training for a half is time consuming,” one of them said. “I don’t know how people find time to train for a marathon. Maybe when all of my friends get married, have babies, and move to the suburbs, I’ll have a marathon and a dog.” I was middle-aged and a number of my friends were having babies, though they hadn’t moved to the suburbs. Yet. I also wanted a dog. ‘Maybe,’ I thought. 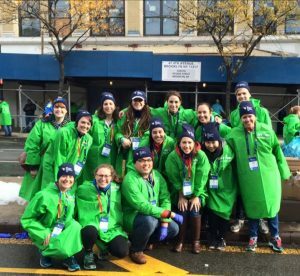 Then I was charged with heading up a team of 20 CHRC volunteers at the Mile 8 water station for the November 1st 2015 NYC marathon. I’m working on a novel that deals with the intersection of the immigrant and LGBTQ communities. I’d done some related advocacy projects that connected me to organizations I wanted to devote my free time to. I lacked the same enthusiasm about volunteering at the marathon with its $255 entry fee. But I was committed to contributing to a running club I’d loved since my first winter run with Danielle. A club made up of warm, kind, funny, fascinating people, every one of whom I felt unequivocal affection for. So I believed I was doing it for CHRC. I didn’t know that the man I’d hoped to spend my life with would begin dying that Day. After 7 years of besting cancer, it came back. The day before the 2015 marathon he’d told me he wasn’t strong enough to undergo the experimental treatment we’d stored so much hope in. When your life falls apart, it’s good to have things you’ve committed to do for others. It’s good to have simple things to do with your hands and eyes, heart and brain. I looked in the eyes of every marathon runner I handed water to. I smiled and called out their names. I absorbed all of that life rushing toward me. On November 5th, a day after his 43rd birthday, my boyfriend left for L.A., where he would start home hospice care with his family. 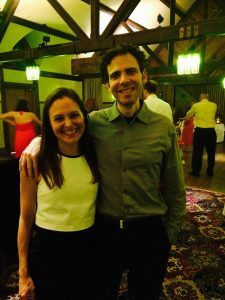 In the two days before I could fly out to be with him, I frantically researched alternative treatments and contacted macrobiotic counselors who said they’d seen cancer patients turn around. And I decided to run the 2016 marathon. I knew that training for 26 miles with a club of people I loved would offer me community and structure. When I could no longer deny the fact that Josh was going to die, the marathon was a path forward. I was diagnosed with the liver disease primary sclerosing cholangitis (PSC) 16 years ago. Josh and I didn’t identify with our diseases. Symptoms punctuated our days, but we’d made wonderful lives around them. We identified as writers, teachers, and Brooklyn flâneurs. We didn’t want to march in parades or attend conferences about our diseases. I didn’t want to run the marathon for cancer. Or PSC. I wanted to run it in celebration of life in all of its wonder, absurdity, and heartbreak, which Josh had loved like he’d loved me. Life exactly as it is and exactly as it isn’t. He told his hospice doctor that he loved his family, friends, work, and life so much. He just wished he had more of it. I scrambled to complete the 3 races and 1 volunteer activity needed to gain 9+1 entry into the 2016 marathon. My ninth race was the New Year’s Eve Midnight Run.There were no volunteer activities left, so CHRC-mate Kaitlyn transferred her extra volunteer spot to me. I volunteered the day after Josh died.